The Summer Reading Program is now the Summer Quest! Registration begins June 4, 2018. Children ages 14 and younger are encouraged to participate in the Uniontown Public Library’s annual Summer Quest. Those who are too young to read can still participate and may have books read to them. Each participant will receive a reading and activity log to record the books and activities they complete during the summer. As they reach their goals, they will receive prizes. One day each week, all readers are invited to attend a special event at the Library for Summer Quest members. Participants are also invited to enter the art and math contests. Support for the Summer Quest is provided by the Friends of the Uniontown Public Library. COMPLETE LEVEL 1: Choose one of our colorful Hawaiian leis AND receive a coupon for a free taco from Taco Bell. Sponsored by Duck Hollow Discovery Learning Center and Taco Bell. COMPLETE LEVEL 2: Pick your favorite alphabet ducky AND receive a coupon for a free Happy Meal from Uniontown-area McDonald’s restaurants. Sponsored by Duck Hollow Discovery Learning Center & Uniontown McDonald’s. COMPLETE LEVEL 3: Choose a stylish zoo animal baseball cap sponsored by Duck Hollow Discovery Learning Center. Also, receive $10 in Ten-To-Spend library money to spend at our Scholastic Book Fair, sponsored by Friends of the Uniontown Public Library & Ten-to-Spend Fund Contributors. COMPLETE LEVEL 4: Receive a coupon for a free children’s meal at Applebee’s Restaurant. Sponsored by Applebee’s. MATH CONTEST: Guess how many gum balls are in the jar and win a Gum Ball Machine. Sponsored by Sheetz Stores. ART CONTEST: Learn how to make a collage and compete for great prizes among five age groups. Sample collages and prizes will be displayed outside the Children’s Library. Sponsored by Sheetz Stores. 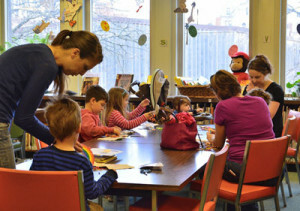 MAKE-AND-TAKE CRAFT TABLE: Get creative and make a new craft to take home each week. Sponsored by Uniontown Hospital. Stop by each week for a new drop-in event, no preregistration required! Thursday, June 7: The Stage Right Players present “Amelia Bedelia’s Dance Party.” Sponsored by Loretta Lazaran, Gerry Dorobish, and Elaine L. Boni. Thursday, June 14: The Carnegie Science Center presents “The Magic of Science with the Cat in the Hat.” Sponsored by Chevron and WQED Pittsburgh. Thursday, June 21: Duda’s Farm presents “What Can a Seed Do?” Sponsored by the Casteel Family. Thursday, June 28: No drop-in event this week. See Special Events below. Thursday, July 5: Cris Johnson presents “The Wacky Science Show.” Sponsored by Somerset Trust. Thursday, July 12: The National Aviary presents “Penguins Are Cool.” Sponsored by 84 Lumber. Thursday, July 19: “Butterflies by Heather” will bring a display of butterflies of the world and offer “grow your own” butterfly kits for sale. Sponsored by 84 Lumber. Thursday, July 26: The Pittsburgh Zoo’s Summer Zoomobile will show us some “Radical Reptiles.” Sponsored by 84 Lumber. Friday, August 3: Photographer Daniel Caron presents “The Symphony of Nature.” Sponsored by Somerset Trust. For the following science and technology-themed special events, limited seats are available and preregistration is required. Please stop by the Library or call us at (724) 437-1165 to save a seat for your child. Wednesday, June 20: The Carnegie Science Center will present two robot-themed events. The program for children grades K-2, “Hello, Robo,” will begin at 11:00 AM. The program for children grades 3-6, “Robots vs. Humans,” will begin at 12:30 PM. Each class is limited to 30 participants. Sponsored by Chevron. Thursday, June 28: The Carnegie Science Center will present “Ready, Set, Roll” for children ages 2-5 at 1:00 PM. A program for children 6 and older, “Rockets,” will begin at 2:30 PM. Each class is limited to 30 participants. Sponsored by 84 Lumber and WQED Pittsburgh. Friday, July 6: The Carnegie Science Center Fab Lab, a mobile 3-D printer lab, will visit from 1:00 – 3:00 PM. Children grades 3-6 can compete in team engineering challenges. Limited to 30 participants. Sponsored by Chevron. Wednesday, July 11 / Friday, July 20 / Wednesday, July 25: At the Teddy Bear Clinics, children will find out about going to the doctor, learn how to apply simple first aid, and even earn a certificate! Brought to us by MedExpress. Monday, July 16: The Carnegie Science Center will present “Making Sense of Sound,” beginning with a program for children grades K-2 at 1:00 PM. Another program for children grades 3-6 will start at 2:30 PM. Each class is limited to 30 participants. Sponsored by Chevron. Monday, July 30 – Thursday, August 2: The “Science in the Summer” program offers a four-day class in astronomy presented by the Carnegie Science Center. Children grades 2-3 meet at 10:00 AM, followed by children grades 4-6 at 11:30 AM. Each class is limited to 20 participants. Sponsored by GlaxoSmithKline. The Book Fair is open every Thursday, Friday, and Saturday from July 26 through August 4. Note that the Book Fair will be operating from 11:00 AM to 2:00 PM this year.